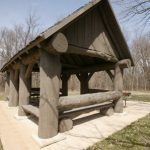 Fox Ridge State Park, just 8 miles south of Charleston in east-central Illinois is known for its steep, thickly wooded ridges, broad, lush valleys and miles of rugged, scenic hiking trails and covers 2,064 acres. In sharp contrast to the flat prairies of most of this section of Illinois, Fox Ridge is set amidst rolling hills along the forested bluffs of the Embarras (“Ambraw”) River. At any time of year, Fox Ridge State Park is a great place to visit. In winter, the snow-softened ridges are alive with birds and animals. In the spring, a panoramic blanket of multi-hued wildflowers and blooming, budding trees celebrate the resurgence of growth. By summer the dense vegetation and new generation of wildlife are thriving in the sun, and autumn brings its brilliant display of color as nature enhances the woodlands with yellow, red, purple and orange. For the day visitor there are many designated picnic areas scattered throughout the park, with tables and grills (ground fires are not permitted), rest rooms, drinking water, playgrounds, two baseball diamonds and sand volleyball courts. 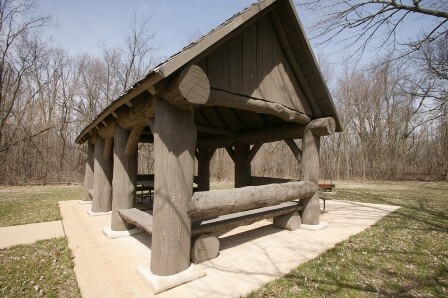 A large, brick outdoor pavilion and eight smaller shelters are available for reunions and group gatherings. Six shelters are available on a reservation basis. Please contact the park office. Youth Group Area is closed. For longer stays there is a Class A, 43 site, Camp area with showers, a group tent camp area, 3 “Rent-A-Camp” Cabins (with bunks for six, electricity, table, chairs and a deck). Picnic tables, cooking grills, drinking water, toilet facilities and a sanitary dumping stations are located in all campgrounds. The shower buildings are closed by November 1st (may be earlier if bad weather) and reopen May 1st (may be earlier – weather depending). Reservations are available. Due to the rich, abundant plant and animal life in the park and its dramatic hills and bluffs, the eight miles of the meandering trail system is the natural focus for most visitors. Each of the ten connected trails has a descriptive marker at the entrance to assist you. Fox Ridge is a ravine of glacial moraine and many of these trails are steep, 18 picturesque wooden bridges and numerous rest benches make them easily negotiable. Turkey, deer, fox, squirrel, raccoon, rabbit, turkey vulture, hawk, owl, quail, pheasant and the lush foliage will make your journey both exciting and restful. Eight separate but looping trails are located within the park. The looping trails allow you to extend or cut short you walk. You can expect to walk along the Embarras River, or through the decidious forest once common in the area. A four-mile horse trail, bring your own horse, no overnight facilities for horses (Horse trail closed from November 15 – April 15). The staircase to Eagle’s Nest has just been completed requiring 144 steps to get you to the deck overlooking the river, providing a wonderful view during the fall, winter and spring. A fitness trail has just been refurbished offering another dimension to the trail system. Two handicapped accessible trails are available one wandering along the edge of a ravine and the other tours a small fishing pond with an accessible fishing pier. Ridge Lake is well-stocked with bluegill, largemouth bass and channel catfish. However, since it is a research facility, fishing is permitted by reservation only. Contact the Illinois Natural History Survey at (217) 345-6490 or write to the park office for dates and times. Fishing in the Embarras River is open to the hardy angler who is willing to descend the steep slopes. Lake Charleston, about four miles from the park, also is recommended. Canoe access: There are two canoe launches, one north and one south provides a five mile trip on the Embarras. In the northern area of the park there are 1,129 acres open for public hunting. Sign in at the park office before using the area. Fox Ridge has a fact sheet available showing the boundary lines and describing the area and species most abundant.